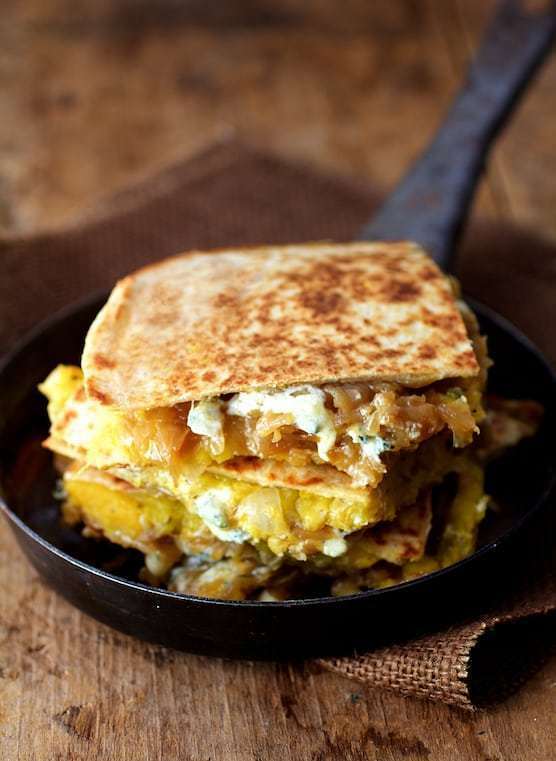 Ring in fall with Butternut Squash, Caramelized Onion and Cambozola Quesadillas! Preheat oven to 400 degrees. Toss butternut squash cubes, onion, jalapeno peppers and garlic with olive oil. Roast for 25 to 30 minutes or until squash and onions are tender. Transfer to a bowl and mash with a potato masher. Set aside. Remove the cover, add salt to taste and continue cooking, stirring frequently for at least another 30 minutes or until the onions become golden to light brown in color. (It's important for the onions to "stick" a little bit here and there without burning as this helps them caramelize.) Transfer to a sieve for the excess fat to drain off. Spread equal amounts of the butternut squash filling on two of the four tortillas. Top with equal amounts of the caramelized onions, followed by evenly distributed bits of the Cambozola. Place remaining tortillas over the filling, pressing slightly to adhere. Alternately, place equal amounts on one half of each tortilla, folding the other half over creating four half-moon shapes. Heat oil over medium-high heat in a non-stick skillet or griddle. Brown the filled tortillas 3 to 4 minutes per side.